Till 31 May 2019 You Can Now Tap & Go on Buses & Trains with Your MasterCard! Earn Up to 10 FREE Rides Worth $15 when You Use UOB Mastercard! Say goodbye to multiple cards and wallet clutter. 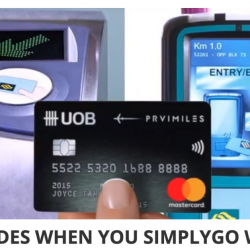 Starting on 4th April 2019, you can now use your Mastercard on buses and trains as part of LTA's SimplyGo initiative! The rides will be billed to your bank or credit card statement. If you are a UOB Mastercard holder, tap and go on buses and trains to earn up to 10 free rides (worth S$15)! Min. spend of S$40 on your daily commute in one calendar month to qualify. T&Cs apply. 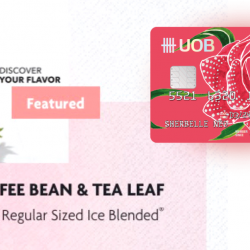 Till 30 Apr 2019 The Coffee Bean & Tea Leaf®: Get S$3 OFF Any Regular Sized Ice Blended® Drink with UOB Lady’s Card! Only the ladies get to enjoy this offer! UOB Lady's Card holders enjoy $3 off any regular sized Ice Blended® Drink at The Coffee Bean & Tea Leaf®! Offer is valid till 30 April 2019 or while stocks last. Try their new Matcha Sakura Ice Blended Drink today! Men, ask your female friends to help you redeem as they can redeem up to 2 drinks per transaction! 1 - 30 Apr 2019 GOJEK: NEW Customers Enjoy $13 OFF Rides! If you haven't download or use GOJEK, here's the time to do it now! DBS has released a promo code which saves you additional $3 off on top of the existing $5 off your first two rides! That's a total of $13 savings! Just input promo code under My Vouchers before your first GOJEK ride to redeem. Valid in April 2019 only. With great fares from SGD128, fly in comfort with Singapore Airlines and SilkAir to more than 50 destinations worldwide. Book your tickets with your American Express® Singapore Airlines credit card, and stand to redeem CapitaVouchers or a Samsonite REXA Spinner with a minimum spend of SGD1,288 and $4,888 respectively. Terms and conditions apply. Book now! 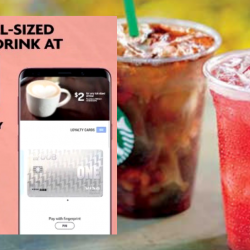 Starbucks: Enjoy Any Tall-Sized Drink at only S$2 with UOB Cards via Samsung Pay! There is no greater bliss than that first sip of your favourite cuppa. From now till 15 Mar 2019, enjoy any tall-sized Starbucks drink at S$2 when you pay with UOB Cards via Samsung Pay! 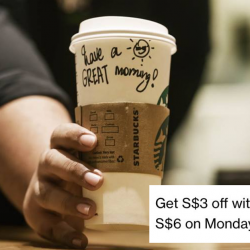 Indulge in your choice of Starbucks drink with this exclusive deal and savour the joy. T&Cs apply. Are you yearning for a Spring break under the cherry blossoms, or dreaming of escaping the hot mid-year days by shopping the best Summer sales? 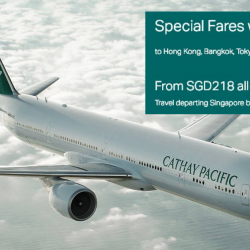 It’s time to plan a getaway and Cathay Pacific is offering fares as low as S$218 to Bangkok and over 40 cities! So book your holidays to favorite destinations like Hong Kong, Japan, Korea and more from now till 4 Mar 2019, and travel between now till 31 Aug 2019 to enjoy exclusive fares with UOB Cards. Book now. T&Cs apply. 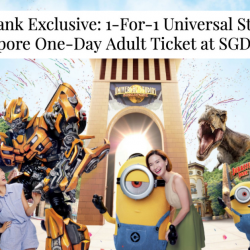 Maybank cardholders, grab this Maybank Exclusive offer to get 1-For-1 Universal Studios Singapore One-Day Adult Ticket at SGD79! Promotion is valid from now till 28 February 2019 for selected date of park visit between 1 March and 31 May 2019. 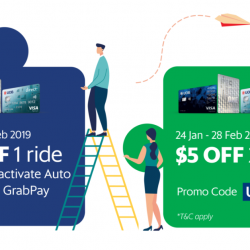 Grab: Enjoy $5 off Your Ride with Your UOB Credit/Debit Card! Enjoy $5 off your ride with your UOB Credit/Debit card! Activate Auto Top-Up (min. $20) with your UOB Credit/Debit card from now till 28 Feb and enjoy $5 off your next ride. Or get $5 off 2 rides by adding any UOB Card to GrabPay! Both offers end on 28 Feb 2019. 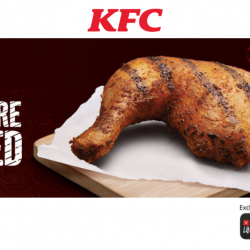 Till 31 Jan 2019 KFC: Enjoy a KFC Signature Grilled Chicken at just $1.50 with a DBS/POSB Card! From now till 31 January 2019, enjoy KFC Signature Grilled Chicken at just $1.50 when you pay with DBS/POSB cards. Applicable for Dine-in, Takeaway and Delivery. Purchase of a meal may be required, please check with staff during redemption. 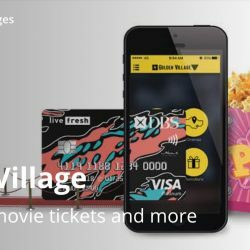 Till 31 Dec 2019 Golden Village: Get Up to $3 OFF Your Movie Ticket with DBS/POSB Cards! Get up to $3 off your movie ticket at Golden Village when you pay with DBS/POSB credit or debit card! Offer is valid till 31 Dec 2019. 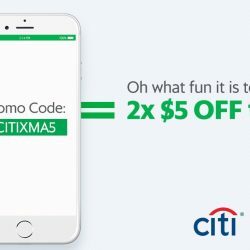 With $5 off your Grab rides, it definitely is the most wonderful time of the year! Just link your Citi Credit Card to GrabPay and book a ride with promo code from 16 - 30 Dec.
Plus, enjoy 8% cash back* on Grab rides, GrabFood orders and GrabPay in-store purchases with your Citi Cash Back Card! Now, you can tick off every gift on your Christmas list! 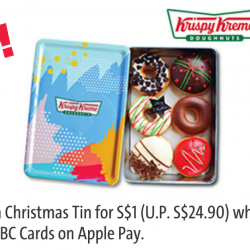 Till 31 Dec 2018 Krispy Kreme: Enjoy a Christmas Tin for $1 (UP $24.90) with OCBC Cards on Apple Pay! Enjoy a Christmas Tin for S$1 (U.P. S$24.90) at Krispy Kreme when you use OCBC Cards on Apple Pay! Limited to the first 5,000 redemptions, while stocks last. Valid from 1 December to 31 December 2018. 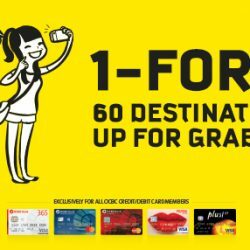 7 - 9 Dec 2018 Scoot: Enjoy 1-for-1 Deals to 60 Destinations with OCBC Cards! Scoot your way out of Singapore now! Enjoy 1-for-1 deals on selected Economy fares to 60 destinations when you pay with your OCBC Card. Book via flyscoot.com/ocbc from 7 to 9 December 2018. Plus, check out other travel privileges below for your accommodation bookings and more! 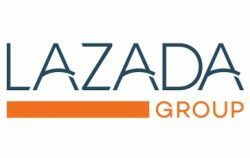 12 12 sale for new App users - get extra $12 rebate with Citibank SMRT card at Lazada! Valid for min. spend of $60. 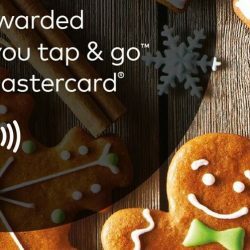 Till 31 Dec 2018 The Coffee Bean & Tea Leaf: Free Upsize on All Beverages when You Tap & Go with Mastercard! Tap and go with Mastercard at The Coffee Bean & Tea Leaf from now till 31 December 2018 and get free upsize on your drink! 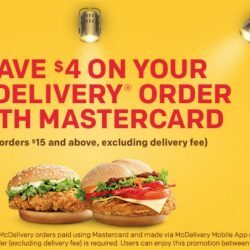 Till 31 Dec 2018 McDonald’s: Save $4 On McDelivery When You Pay By MasterCard! Save time with McDelivery, and save $4 when you pay by Mastercard! Just spend minimum $15 excluding delivery fee from now till 31 December 2018, while stocks last. Fly to exciting destinations on your next holiday on Cathay Pacific Airways! From the night markets in Taipei to the Buckingham Palace in London, excite yourself with new experiences as you discover places. 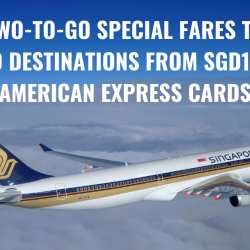 Enjoy their special Economy Class fares from SGD$228 all-in, with DBS/POSB Cards. Offer ends 8 Nov 2018, book online now. 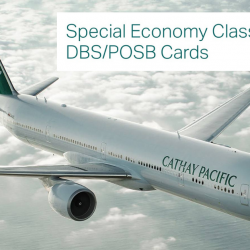 Book by 29 Oct 2018 Cathay Pacific: Exclusive Economy Class Fares from SGD228 to Over 50 Destinations with OCBC Cards! Escape on a grand adventure with Cathay Pacific. From 9 to 29 October 2018, enjoy all-in fares to over 50 destinations worldwide, starting from just S$228. For travel by 30 June 2019, unless otherwise stated. Pay with your OCBC Card to enjoy! Indulge in the freshest International buffet spread at Marriott Cafe, where the chefs take centre-stage to whip up a perfect culinary storm for you. Find the freshest selection of oysters, snow crabs, crayfish and prawns at the Seafood Station, before indulging in some piping hot noodles cooked à la minute. Savour renowned local dishes such as the Singapore Chilli Crab, Chicken Rice or visit the hot buffet line for an extensive array of premium meat dishes such as Crispy Pork Saddle with Pancetta, Prunes and Mixed Herbs, Roast Beef and other roasted delights cooked to perfection at the Beech Oven Station. For those with a sweet tooth, their signature desserts include the Sticky Date Pudding that will make for pure palate pleasers after a satisfying meal. 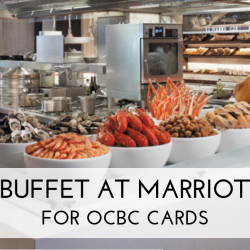 Now with OCBC cards, you can enjoy 1-for-1 High Tea or Dinner Buffet from now till 31 October 2018! Jio your friends now! From the night markets in Taipei to the Golden Gate Bridge in San Francisco, excite yourself with new experiences as you discover places. Enjoy Cathay Pacific Airways' Special Economy Class fares with Citi Cards from SGD$228 all-in. Offer ends 17 Sep 2018. Till 30 Sep 2018 EZ-Link: Get 10% Rebate on Your Transit Rides with EZ-Reload! Never queue to top up your EZ-Link again! 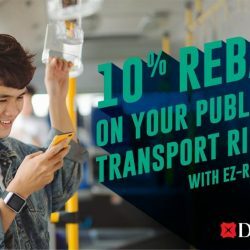 Get 10% rebate on bus and train rides when you register for EZ-Reload (Auto Top-Up) with your DBS/POSB card on the EZ-Link app! Valid till 30 September 2018. Be the first 10,000 to sign up for EZ-Reload (Auto Top-up) with your DBS/POSB card from 1 August to 30 September 2018 and enjoy 10% rebate on your bus/train rides! Jetstar is having a very special SALE, just for DBS and POSB cardmembers, with fares to 26 destinations starting from SGD50! Promotional fares are limited and can only be booked at jetstar.com, and payment must be made using DBS and POSB cards. Sale ends 16 August 11.59pm SGT so hurry and book now at jetstar.com/sg/en/deals/dbs-posb! 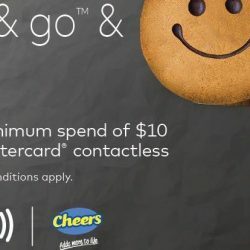 7 Aug - 6 Sep 2018 Cheers: Tap & Go™ with Mastercard® Contactless & Get $3 OFF with Minimum Spend of $10! Get rewarded for doing things the easier way! Tap & go™ with Mastercard® contactless for your purchases and get $3 off with a minimum spend of $10. Go cashless and get rewarded at Cheers now! 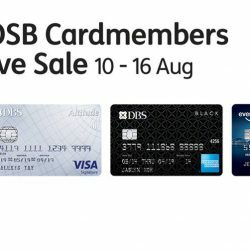 Valid from 7 August to 6 September 2018. 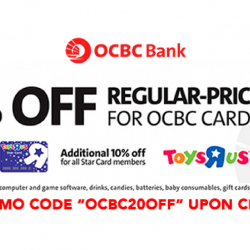 From 5 – 9 August 2018, OCBC Cardmembers get 20% off regular-priced items at Singapore’s biggest toy store – Toys"R"Us. What’s more, Star Card members get an additional 10% off! Deal also applies online with promo code!